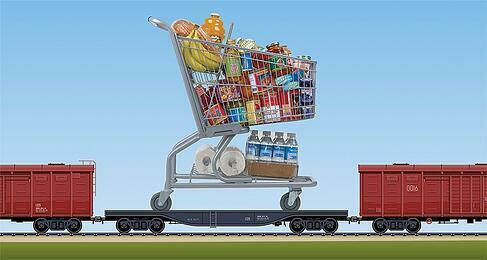 Intermodal rail simply wasn't seen as viable option for consumer goods distribution. But rail service has improved to the point that products that would never have seen the inside of an intermodal container are now moving across the country at a lower cost and with a reduced carbon footprint. While intermodal rail is typically not a good option for short-haul moves, it is gaining serious steam for long-haul freight. U.S. rail intermodal volumes have gone from 3.1 million containers and trailers in 1980 to 13.5 million units in 2014 (Association of American Railroads). Among the reasons: volatile fuel rates, improved service levels, and corporate mandates for greener freight solutions. The biggest driver, however, is the ability to lower costs at least 15%-20% with intermodal based primarily on fuel savings. Here are some examples of consumer goods companies who have shifted from OTR to intermodal rail. Pet food company WellPet ships primarily to pet product distributors and specialty retail chains, like Petco. Product ships via truckload from copackers and manufacturers throughout the country into a Northeast DC. Because WellPet’s products are heavy, they usually reach maximum weight before cubing out the trailer, so the company looked for ways to improve efficiency and decrease costs. Today they rely more on intermodal moves for long-haul and inter-mill shipments. According to the company, on-time delivery and more predictable lead times have paved the way to greater use of lower-cost rail. Rail is the most economical and sustainable mode for overland movements. As a result, retail and grocery type products are traveling on rail for the longest part of their journey to market and, in the process, delivering major freight savings and carbon footprint reduction for their manufacturers. Read more in our Viewpoint paper: "Look Who's Riding the Rails."